Getting all 96 councillors to have undertaken a day’s “carbon literacy” by the end of 2014, got the certificate/the t-shirt etc. Get those councillors who want to go on and get some as-yet-hypothetical “qualification” (“carbon capability”?) in 2015. Ask the favourite of your three councillors if they are carbon literate (they probably aren’t) and when they intend to get around to it. Ask your three councillors if they are carbon literate (they probably aren’t) and when they intend to get around to it. Tell us what they say. Don’t be fobbed off! Read our proposed implementation plan/ideas. Critique them, add to them. Suggest ways that we can encourage the councillors to get around to it, and to use the fact that they are doing it to get OTHER “prominent” people doing it. 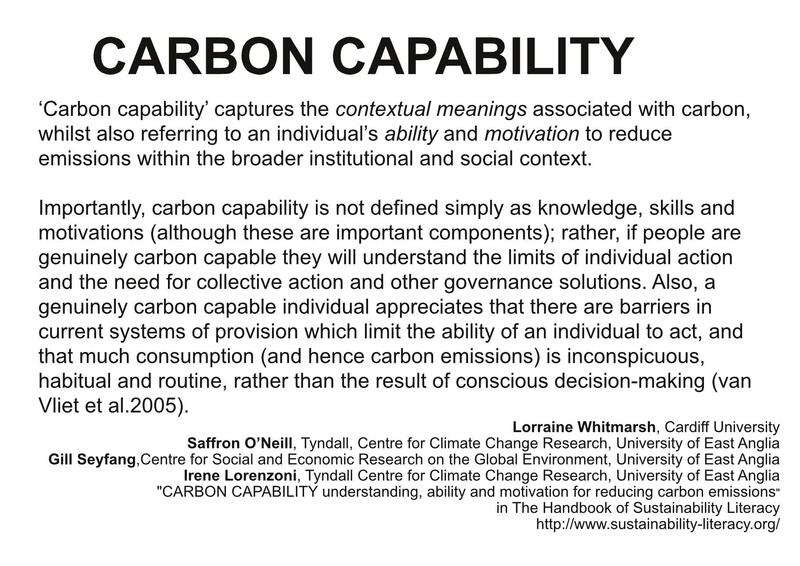 Look into “carbon capability” as the logical next step (and goal for 2015/6!). What is it? Join us in planning to make it happen. Make a spreadsheet of who is and isn’t carbon literate. Get the Executive Members to declare when they intend to do carbon literacy. Get the chairs of all committees (scrutiny and otherwise) to declare when they intend to do it. Get all members of the Neighbourhoods Scrutiny Committee to declare when they intend to do it. Plug all that into the spreadsheet, then keep tabs on them, ticking them off when they do it. Get all candidates for council posts to declare if they are “carbon literate” and if not, when they intend to become so. Regular letters to the press/social media campaigns about who is and isn’t carbon literate, how many councillors have done it. 90 in 11 months. But nowt happens in August, and not much in December. So you’re really looking at 10 per month. Given that it will be mid-February etc, you’re looking at 12 per month. 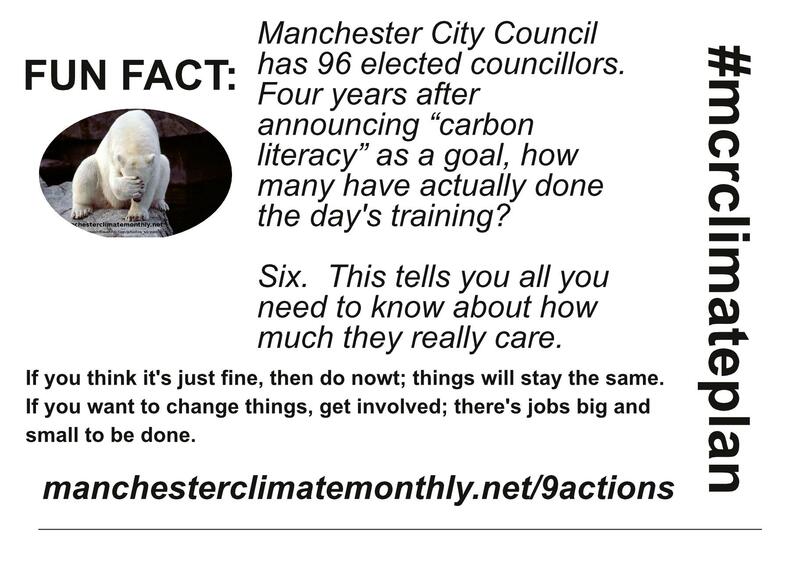 Which means by the Council elections there should be approximately 42 “carbon literate” councillors. Yeah, right. Risks – done as big “job lots,” with councillors merely turning up, facebooking all day and then getting the certificate at the end. Getting twenty councillors more tooled up – an in-depth awareness of local, national and international climate policies, the ins and outs of institutional responses, of mitigation and adaptation, and what the opportunities are in Manchester. It would be interesting to know who was both willing and able to organise that. “This is too ambitious/councillors very busy.” So, the MACF document is to be ignored, then? “Carbon literacy” isn’t the only way to show you know/care about climate change. Indeed, but it’s a certificate that the Glorious Leader has been very proud of.